In just three short days, Captain America: Civil War will hit theaters nationwide, which is expected to open huge at the box office this weekend. This superhero adventure kicks off Marvel's expansive Phase 3 slate, by splitting this universe in half, with heroes going into battle against each other. Today we have two new clips, each of which showcases members of both sides, Team Cap and Team Iron Man, with brand new footage. The first clip, courtesy of Marvel.com, features an extended look at an intriguing scene we've seen in the trailers, where Captain America (Chris Evans) uses his incredible strength to stop a helicopter from taking off. However, we never saw who was piloting this aircraft. Now, we can see clearly that it's The Winter Soldier (Sebastian Stan) at the controls. Unfortunately, we don't get any context about why Cap is trying to stop Bucky from taking off, or why Barnes tried to use the helicopter to kill Cap. The second clip comes from today's episode of Good Morning America, where stars Elizabeth Olsen (Scarlet Witch) and Paul Bettany (Vision) appeared on the show to promote this superhero adventure. 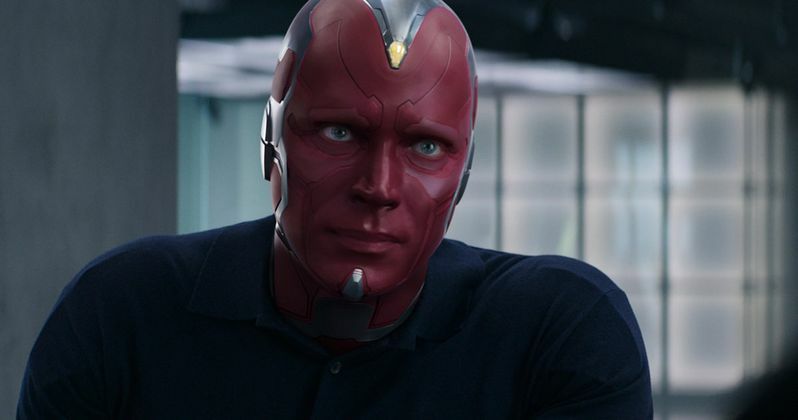 They brought along a clip where we see Vision discussing the Infinity Gem that resides in his head, known as the Mind Stone. Vision reveals to Scarlet Witch that he doesn't know much about this object, only that it's not of this Earth. But he's trying to understand it more and more every day. If that wasn't enough, we also have a new viral video to check out. As part of WHIH World News' viral campaign, the news organization posted two more videos today, one of which features Christine Everhart (Leslie Bibb) and Will Adams (Al Madrigal) conducting an exclusive interview with U.S. President Ellis (William Sadler). The President weighs in on how the Avengers need to be watched over by some sort of government organization, even though he appreciates their efforts in responding to threats around the globe. WHIH also posted another video which covers the "breaking news" of an attack in Lagos, Nigeria, where several of the Avengers were present, along with the villainous Crossbones (Frank Grillo). This video also includes President Ellis speaking "live" about the tragic incident, detailing plans to support Lagos in their time of need. The incident in Lagos has been described as one of the inciting incidents in Captain America: Civil War, which drives a wedge between Earth's Mightiest Heroes. With just three days left until this movie hits theaters, we'll be sure to keep you posted with any more footage of special news reports from WHIH. In the meantime, take a look at the clips and viral videos below, as we get closer to the May 6 release date.